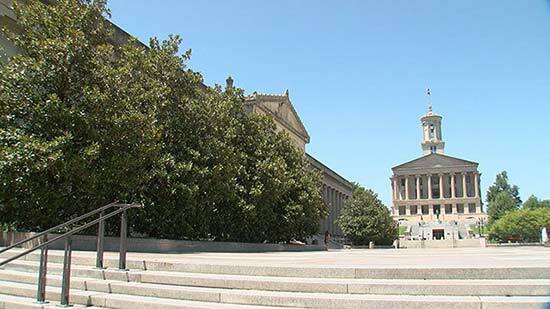 NASHVILLE, Tenn. (WKRN) - Two leaders of a youth government group say Tennessee lawmakers need to focus on gaps in education and infrastructure, plus one of them had some advice for Governor Bill Lee's decision-making. said the YMCA's Youth in Government Governor Sara Ali as she first addressed her fellow students, then walked into the Tennessee House chambers with the real governor. Unlike Tennessee, the YMCA group has a long history of female governors. Governor Bill Lee also offered a few words of advice. "The most important thing that you can do is stay engaged with those who represent you,"
the first-term Republican governor told the student governor. Both the youth governor and youth speaker say they have already been engaging with lawmakers. "Speaker" Mark Hancock shared with us what he told the real Speaker Glen Casada today on Capitol Hill. "For me, infrastructure and voter turnout are really important, so I've been urging them to look for solutions to tackle that problem,"
The advice from the youth governor to the actual governor included some tactics when it comes to decision making. "I gave [Gov. Lee] headphones -- they were YMCA headphones -- and I said, 'If anyone is bothering you when you are making a decision, block them out with these headphones.'" Like the real governor and House speaker, the youth governor and youth speaker are from Williamson County.